Peace Concluded by Sir John Everett Millais is chock full of little clues as to what the painting is about, in case the title didn’t answer it for you. The scene is set. 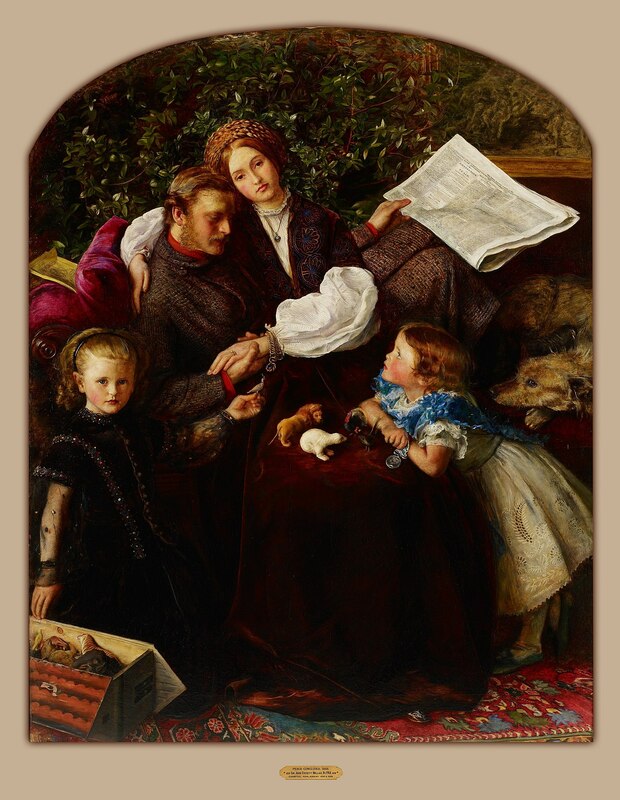 There’s a lovely-looking family complete with small children, a dog, a husband, and a wife, who, side note, was modeled after Millais’ own wife. On first look, it could be a Christmas card, but upon closer inspection, it’s much more than that. The man is reading a newspaper that is declaring the end of the Crimean War – a war in which the man fought and was injured. This fact is communicated through the man’s rather questionable fashion choices. He is wearing a dressing gown, meaning that he is recovering from a wound of some sort – one that is hidden by said gown. His daughter on the right is holding a medal with Queen Victoria’s face on it, which could only be earned by fighting in one of the major battles of the Crimean War. She is also playing with a Noah’s Ark toy set. She has on her mother’s lap animals that represent each of the countries involved in the war – a lion, which represents Britain, a bear, which represents Russia, a turkey, which represents the Ottoman Empire, and a rooster, which represents France. Her mother’s dress is blood red, referencing the violence of the war. The daughter on the left is holding a dove with an olive branch, a symbol of peace, as well as a part of the Biblical story of Noah’s ark. It was a dove that came back to the ark with a branch that proved to Noah that there was still land after the flood. Not all of the clues are about the war, though. The dog, which is an Irish wolfhound, indicates loyalty to man as well as marital fidelity since there is a wife in the picture. The myrtle bush, which is evergreen, is a symbol of eternal love. The yellow book placed behind the man is the novel "The Newcomes" by William Thackeray, a book about an incredibly pious military man who goes to war and remains faithful to his wife. So now we know extensively that neither of these folks had any side pieces while they were separated. The family’s clothes and the living room in which they are set indicates great wealth. Lots of velvet and lace. You know the vibe. And just so you can’t misunderstand the fact that this about the end of war, there is a print of a battle scene on the wall behind the myrtle bush. Peace, ya'll. Shefer, Elaine. "The Order of Release and Peace Concluded: Millais's Reversal of a Victorian Formula." Woman's Art Journal11, no. 2 (1990): 30-33. http://www.jstor.org.libproxy.newschool.edu/stable/3690696. Peace Concluded, 1856 (1856) is a painting by John Everett Millais which depicts a wounded British officer reading The Times newspaper's report of the end of the Crimean War. It was exhibited at the Royal Academy in 1856 to mixed reviews, but was strongly endorsed by the critic John Ruskin who proclaimed that in the future it would be recognised as "among the world's best masterpieces". The central figure in the painting is a portrait of Millais's wife Effie Gray, who had previously been married to Ruskin. It is now in the Minneapolis Institute of Arts. Check out the full Wikipedia article about Peace Concluded.